Who’s Borrowing Now? The Young and the Riskless! Last week I mentioned that “Student Loans Account for 59.5% of the Consumer Credit Added in 2013”. This week the New York Fed explains in the post, Just Released: Who’s Borrowing Now? 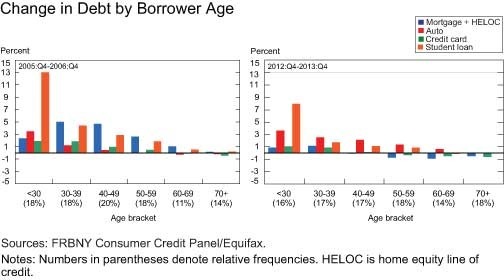 The Young and the Riskless!, that the credit card borrowing grew for folks with high credit scores. 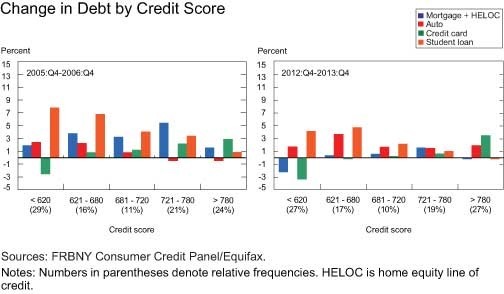 Since the total credit card debt barely grew in compared to 2012 the increased borrowing by those with high credit scores was offset by reduced borrowing by those folks with lower credit scores. This data leads me to believe that in 2013 this consumer driven economy was stuck in stall mode. Hopefully 2014 will be better. Their site has been up and down today so here is a copy of their chart. For those folks who want to play with the data more you should take a look at the Fed’s interactive graphic or download the spreadsheet. ← What is a Well-Functioning Insurance Market?